I found myself on a bus this evening. (Don’t most of my blogs start this way??). It was leaving a shopping mall and it was packed full of retail employees and shoppers alike. I had been waiting a while and was rewarded with a seat, which was a relief for my aching feet. I didn’t have my iPod, so was forced to listen to the ramblings of teenagers while reading Twitter feeds which is often exactly like listening to the ramblings of teenagers. A group of four of them were standing near the exit. Two guys and two girls. I love to watch people and speculate what their situations are. I don’t think these were couples. I think they were just either co-workers or classmates or something along those lines. This girl was speaking with a confidence you can only have as a teenager, because it’s yet to occur to you that you know virtually nothing compared to what you will eventually know. She was talking about something harmless like funny TV commercials, and doing a poor job at explaining why they were funny, but laughing hysterically anyways. One of the guys in the group was trying hard to give positive feedback to what she was saying, probably because he was interested in her, and wanted to keep a flirty dynamic going. They were just excited to be there. I don’t even know why, but I assume it’s because they were probably about 18 years old, and why wouldn’t every moment of your life be that exciting. Most 18 year olds have yet to be beaten down by responsibility, and they’ve got lots of good times ahead. I remember what it was like to ride a bus with some girls that I might have a crush on, and maybe have nothing much to do afterwards except for watch a movie, or play video games, or just getting into random mischief. That was fun. I switched back to my phone and scrolled down on my Twitter feed to find out the following. My favourite music album of all time was released 20 years ago today. 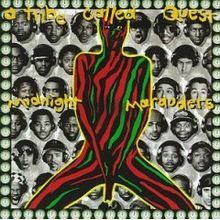 For those wondering, or not familiar enough to grab it from the blog title, it was Midnight Marauders by A Tribe Called Quest. I’ll only spend a second telling you why it’s the greatest, because this isn’t a music blog, although I think one day I will start one. All I do is talk about music, so why not just start a new blog, other than I don’t have time? A Tribe Called Quest was and is the greatest thing that ever happened to Hip Hop music. Midnight Marauders was the moment when Hip Hop achieved its true potential, and was never before and never again as pure, exciting, creative, accessible, and lets just say perfect. There will be varying opinions from Hip Hop purists, but not too many would go out of their way to refute this claim. I don’t mean to disrespect any of the great music that came out before this moment, or anything that evolved out of this moment, but on November 9, 1993 Hip Hop hit its peak in my not-so-humble opinion. It was a Tuesday. I was an 18-year-old high school student. Probably not unlike the ones I saw on the bus. Excited just for the sake of being excited. A lot was going on in my life. I had a girlfriend, who came over to my house after school to see it for the first time. Not that she’d never come over before, but my parents had recently purchased a new house. This house was big. I’d lived in a semi-detached house my whole life leading up to this, but my parents leveraged a really poor real estate market, and got a house (that they probably couldn’t afford) in the same neighborhood, but just bigger. It had 4 bedrooms upstairs, and a swimming pool. I curse the thought of how much time and energy I’ve spent maintaining that pool vs. how much I’ve actually swam in it, but nevertheless, some of my greatest nights involved having friends over while my parents were out-of-town. A great party house! The best part of the whole thing was that there was a bedroom in the basement, which I quickly laid claim to. The basement was straight out of 1972 with its stucco, awful carpet, faux beer keg in the wall, and a small hidden bar compartment also in the wall. It was designed to be a 1972 party pad. This was 1993 however, and the rest of my family thought this basement was an eye-sore, and steered clear of it. Suited me fine. It had just the right amount of privacy an 18-year-old kid would want. So I was showing my girlfriend around this house, and I was specifically remember that she was only there for a few minutes on her way home from school because I had a 5-close shift at my part-time job that night, which I would have to leave for shortly. I was feverishly calling around to see if anyone would take my shift because A Tribe Called Quest’s new album was coming out today, and I needed to get it…..TODAY! The amount of time that had elapsed between Tribe’s 1991 offering, (and my favourite album at the time ‘Low End Theory’), and the one that came out that day seemed like centuries. These were the days of long summers, and even longer school years! If I’m obsessive about music now as a (usually) mature adult, you can only imagine how unreasonable my longing was for this album to come out. How was I going to get it if I had to go to work? I worked through the book of co-workers phone numbers, and it became evident that I wasn’t going to get this shift covered. I called my oldest friend in the world, also a Tribe fan, and also a co-worker at this particular job to tell him of my plight. He seemed unaware that today was the magical day that ‘Midnight Marauders’ was released, and was on store shelves as we spoke. (Do people really not know about release dates?? Am I the only idiot that would know about this in advance?) In a move that I hadn’t considered, he said he wouldn’t take my shift, but that he was going to drive over to the mall and buy the album while I was at work. This sounded great, but I couldn’t believe that I would have to spend 4 hours at a job while he was in possession of something I’d waited centuries for. This was to be the longest 4 hours ever. I tried to convince him not to listen to it until I got there. He assured me that he would listen to it at least 3 times before I got there, but offered to ‘tape it for me’. Let me explain what I mean by ‘tape it for me’. Let me start by saying I never really thought I would ever have to explain that. I believe the days have arrived where this term requires explanation. While CDs are not yet obsolete, in the fall of 1993 I was a couple of months short of acquiring my first CD player. I was relatively happy listening to my music on tapes, and sometimes vinyl. While vinyl is making a comeback, I don’t think tapes ever will. The good thing about tapes is that you could record stuff on them, and they were cheaper. So my friend was offering to buy the CD for himself, and tape it for me so I could own it for free, and have it instantly….. that is after my 4 hour shift was over. I agreed, and headed over to his house on my way home from work. I found him asleep on his couch. I asked him for the tape. He had forgotten to make the tape, and once we established that I wasn’t leaving without a tape, he said he would happily listen to the album again while I made the tape. Then he gave me what I can only describe as a ‘Bill Cosby Jell-O Pudding Smile’ and said ‘it’s really good’. I knew it would be somehow. So I started to listen. Every track was incredible. It was simply the best thing I had ever heard. Who knew that would be the last time I ever thought that. 20 years later, and it’s still the best thing I ever heard.